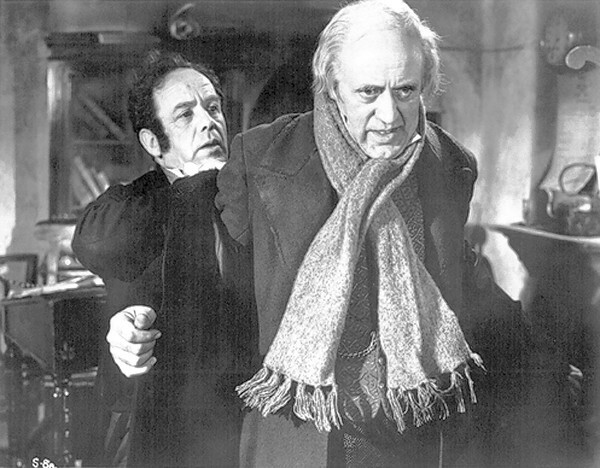 Originally entitled SCROOGE, this 1951 CHRISTMAS CAROL, starring Alastair Sim, is considered by many to be the premier version of the Dickens classic. I’ve watched a version per year for the past four years, so it’s good to get at another one that is new to me. I feel like I could see a new-to-me CHRISTMAS CAROL every year until I die and there would still be a dozen left over I haven’t seen. Dickens’ classic is just one of those immensely filmable stories. I watched A CHRISTMAS CAROL (1951) on 12.22.13. It was my first viewing of the film. This British telling of CHRISTMAS CAROL is a traditional version which sticks mostly to the Dickens novel, save for a few variances to make the Christmas Past section have more resonance. Indeed, this movie has all of the beats and moments everyone has come to expect in a CHRISTMAS CAROL. It is also evident that the animated Robert Zemeckis version from 2009, starring Jim Carrey, borrowed heavily in look from this 1951 film directed by Brian Desmond Hurst. Of course, any CHRISTMAS CAROL lives or dies by the effectiveness of its Ebenezer Scrooge. Alastair Sim really nails it here. His Scrooge is not particularly angry or scary. He is, instead, an unfeeling old man who has no patience for merriment and no time for kindness. Usually the line “Let them die and decrease the surplus population,” is delivered with malice. Sim delivers it with indifference. He doesn’t want them to die, particularly, he just doesn’t care if they do. For anyone who has lived in a cave for the last couple of centuries, CHRISTMAS CAROL tells the story of an old businessman, Scrooge, who lacks the holiday spirit. He is visited by a series of ghosts who show him moments from Christmases past, present, and future. He learns to embrace the spirit of the season and become a better man. The production quality on this film is solid. The music is moody and effective. The tone is quite dark, particularly in the Christmas past sequences. The black-and-white cinematography serves the telling well, as the shadows and bits of grey compliment the mood of Scrooge. Perhaps the practical special effects used to create the ghosts are dated by six decades of advancement in CGI, but there is nothing here which comes across as inept or funny. Instead, the entire movie feels quaintly simple; a throw back to a simpler time in film history, just as A Christmas Carol is a throwback to Dickens’ time. This is not a particularly exciting telling of the story, though it is compelling. Beyond Sim, there is not much memorable in the ghosts or the Cratchit family. Instead, this is a traditional telling which hits a nice tone and rides its star. Sim really does elevate this to a whole new level. Even if this isn’t the best telling of CHRISTMAS CAROL, it is certainly the best performance of Scrooge. Indeed, this movie should be elevated to the high end of the list if only for Sim. ~ by johnlink00 on December 23, 2013. Haven’t seen this one. Sounds worth viewing, though. Over the years I haven’t watched any film that has done the novel any justice, but I will most definitely give this one a try — only because of your appreciation of Sim. If you like versions that stick to the feel of the novel, this one does it. There’s a bit of superfluous stuff in Christmas Past, but nothing glaringly out of place.